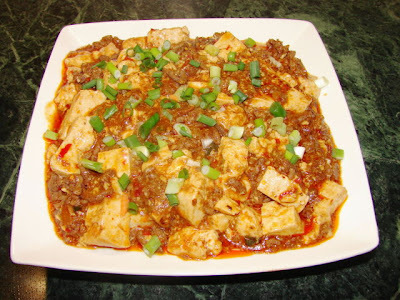 Chinese called this Mapo tofu 麻婆豆腐, loosely translated in English as 'pockmarked woman tofu'. Several legends all slightly different telling the story how this dish was developed. The story I read said at the end of Ching Dynasty, in Chengdu (Sichuan) by the Wan Fu bridge, a pockmarked woman took over her husband restaurant after he died. There were few street traders who frequently ate in that restaurant always bring in some beef and had the lady to cook something for them. The lady concocted a lovely spicy sauce to flavour meat and tofu which had become very famous till today. Extra chopped spring onion and fresh chilli for garnish. Heat oil in wok add garlic, stir for 10 -15 sec, add the chilli bean paste and yellow bean paste (or black beans) stir till fragrant, add mince, stir till browned then add soy sauce, oyster sauce, sugar, ground pepper, stock and chopped chilli (optional). Cut tofu into chunks, add to meat sauce, stir gently and simmer till hot. Add cornflour, when thickened add chopped spring onions. Sprinkle on chilli oil or sesame oil but don't stir. Transfer onto serving dish, sprinkle with Sichuan pepper if like. Sprinkle with more spring onion and fresh chilli. Note: qty of all types of sauces is a guide, you can add as much or as little as you like, don’t add too much, it can be salty. You can always add more after you add the stock. Many people like to add loads of oil or chilli oil, I don't like it bathing in oil but if you like it use much as you like. For a vegetarian version, sub beef with chopped shitake (handful after soaked) and some chinese preserved vegetable like this. If you use zha cai either soaked to reduce the saltiness or reduce some of the sauce. WOW (impressed look). Your version looks so yummy.